Now, over 300 Charter Hall staff collectively work across two levels in the new Activity Based Workspace, designed by BVN Architects. With this move Charter Hall employees were inducted into a new way of working, as part of a larger employee engagement piece. , were commissioned to highlight Charter Hall’s sophisticated yet ‘edgy’ personality through environmental graphics and signage. The team were briefed to build on BVN’s ‘industrial sophistication’ scheme, drawing on a range of material and graphics to liven the space and secure its unique identity. Urbanite used the design of the Charter Hall logo as a foundation for the graphic approach - one that connects all touch points. A grid was developed around the idea of multiples, reflecting a diverse workforce of Charter Hall. A grid created from the forms of the brand mark, underpins these multiple elements. The grid and facets display across ceiling frescoes, stair features and wall installations. 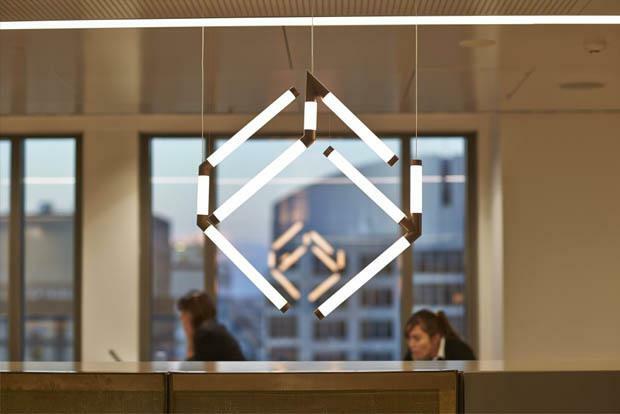 A reception light installation was developed in partnership with Arup to create a sculptural point of interest, and interpretation of the brand identity.